Over the past few years, I’ve been raising a young one. We’ve laughed, we’ve loved, and I’ve watched him grow. Saying goodbye was the most painful thing I ever had to do, but it was worth it if only just to be there for that one moment when he went out to make his way in the world. I will never forget my sarlacc. It all started when I was on a business trip, selling canned yams on Tatooine. Through a bizarre string of circumstances, I found myself at the annual Mos Eisley fair playing a game of bingo with some Jawas. I won and many angry shouts of “ootini!” ensued. As I was leaving the bingo table, one of the Jawas handed me my prize: a dirt-filled clay pot with a curious creature inside. Me: Baby sarlacc, have you seen Mildred’s pet parakeet? I told her I’d watch it for the weekend, but I can’t find it anywhere. Me: Baby sarlacc, why are there feathers around your pot? Me: Naughty, baby sarclacc! Naughty! You know that, in your belly, that bird will find a new definition of pain and suffering as it is slowly digested over a thousand years. Me: Well, what am I supposed to tell Mildred? Me: No, you cannot eat Mildred. You can’t solve all your problems by eating them, baby sarlacc. Me: Well, maybe if she doesn’t pay me that five bucks she owes me. The years went by and my sarlacc grew older. Pretty soon, I had to move him from his little pot to a pair of extra large, soot-filled bell-bottoms to a sinkhole in the backyard. He was a good boy and always played nicely with his little friends (he only ate six of them.) And he matured quickly; he was eating solid door-to-door salesmen when most sarlaccs his age were still on dachshunds. Me: Adolescent sarlacc, come here. Me: Adolescent sarlacc, did you devour the entire population of Tokyo again? 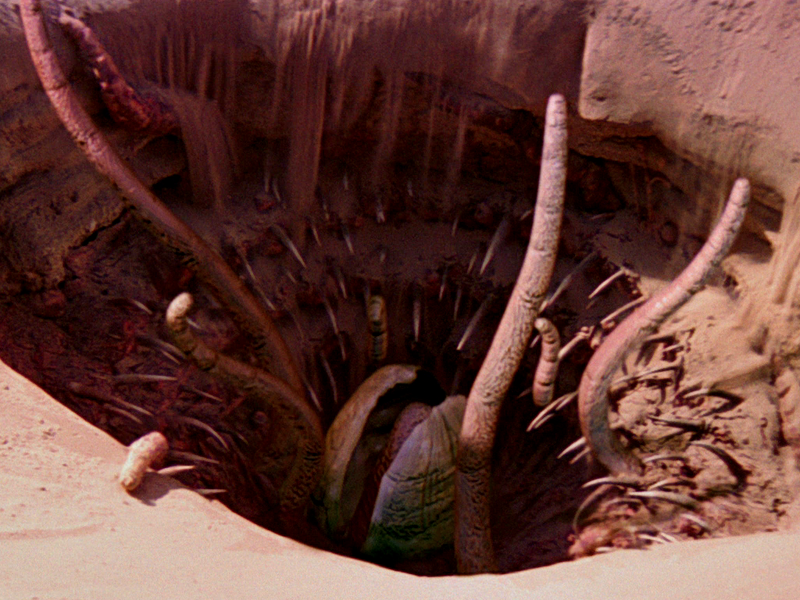 Me: We’ve talked about this, adolescent sarlacc. You can’t just go around eating major metropolitan cities. Me: Don’t you take that tone with me! Have you been hanging out with that thing from the asteroid again? You know I think he’s a bad influence on you. Me: And where were you last night? You weren’t skulking around Jabba’s Palace again, were you? Me: No, adolescent sarlacc! What you feel for the Rancor is not love! Somehow, we got through those difficult teenage years and my sarlacc’s high school graduation day came. It felt like my heart was ready to burst with pride. He was the only one in his class to graduate, the rest of the class having mysteriously disappeared the night before. That summer, my little sarlacc decided to become a podiatrist. Me: Well, that will be among your many triumphs. Someday you’ll achieve great things. I’ve always believed that. You have your dorm assignment, right? Me: And your change of socks? Me: Good. Okay. There are always plenty of tourists around the Grand Canyon, so you shouldn’t go hungry. And…I guess that’s it. Me: No, I’m fine. I just have something in my eye. Me: Don’t be silly. Now, hurry up or you’ll miss your train. And so, my sarlacc boarded the train (somehow) and it chugged away. I watched until I could no longer see his tentacle waving goodbye. He graduated from podiatry school and went on to open a private practice on Endor making orthodics for Ewoks (he tells me they taste like popcorn chicken.) It wasn’t easy raising a sarlacc, but it was by far the most rewarding and meaningful experience I’ve ever had. And that ain’t Bantha poodoo.